With some hefty away-time, and some even heftier work upon returning, Eilean has really come of age. Having left her training the final level of Advanced Mass Production, she’s now able to produce 11 things at any one time. This is great news for me, because personally, I need all the build slots I can get! She's a funny-looking one, isn't she! But this is besides the point, and one must not rest on one’s laurels! The inclusion of those core skills last time around means she’s ready for more science skills. Its a bit more complex than your tech 1 builds. If you’re completely new to production, there’s some basic stuff you need to understand about tech 2. Tech 1 products use minerals (from mining, from reprocessed loot, or from the market) to build stuff. Tech 2 uses the finished tech 1 product plus a load of other stuff; its actually a combination of trade goods, planetary products (from PI), manufactured components (more on those in a moment) and some Morphite minerals. This applies to all ships and modules, but not to ammunition. 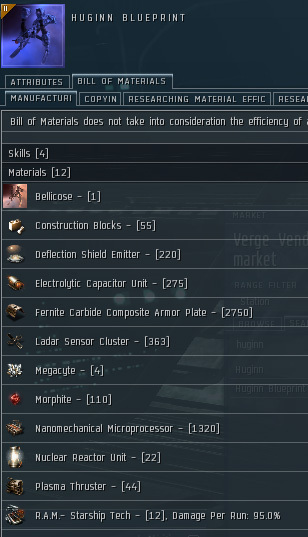 Barrage L for example, does not require a load of tech 1 ammo to be produced. Look again at the Huginn blueprint. Deflection Shield Emitter, Electrolytic Capacitor Unit, Fernite Carbide Composite Armor Plate, Ladar Sensor Cluster, Nanomechanical Microprocessor, Nuclear Reactor Unit and Plasma Thruster – These are all tech 2 building components. It doesn't use just minerals, so it doesn't just use tech 1 industry skills. This one uses Fernite Carbide, Ferrogel and Sylramic Fibers. These are all processed, moon-mined materials that are often referred to as ‘moon goo’. Unless you have some reliable friends out in a space-holding 0.0 alliance, your best bet with moon goo is just to buy it at a trade hub like Rens or (sadly) Jita. The important thing to look at for us wannabe tech 2 producers (or mules!) is the skills section. Each component requires a specific science skill to build, and in all cases they need to be trained to level 3. This Deflection Shield Emitter makes use of Hydromagnetic Physics. Make a note of this, or just buy up the skill. You don’t have to go for these specifically. Just use this process to find out what components you need for whatever you want to build later on. 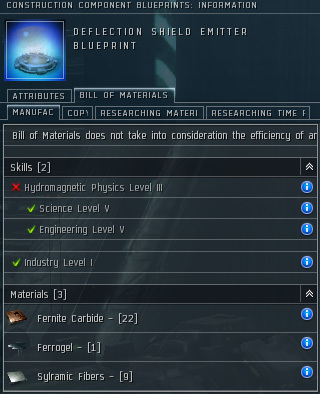 Each skill costs a chunky 10mil ISK. For a single skill, its not too bad, but when you need to buy a lot, it gets expensive very quickly! Buy the skills you need, inject and start training them up to level 3 each so you’re good to go. While training, try sourcing the BPOs for each of the components you need, as well as the tech 1 item (if applicable). If some of the blueprints seem inordinately expensive, then you’re probably buying straight from an inflated price order of another player. Visit the appropriate empire to which the blueprint belongs. See here for some tables showing you which belong to which race. While last time we got away without spending a penny, today has been pretty expensive, buying a total of 6x10mil skillbooks. This bring my personal running total to: 111,130,890 ISK. 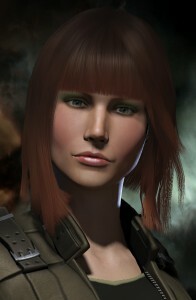 It might seem like a lot for a newish character, but its no more than a fitted battleship when you think about it. Nice to see another update, been following this with great interest as I have my own industrial alt.